In the early 1960s James Bertram referred to the three K.S’s (Kendrick Smithyman, Keith Sinclair and Karl Stead) as ‘the Auckland Metaphysicals’, a description repeated by Louis Johnson in 1964 – and it’s true we were all influenced by John Donne and by T.S. Eliot’s essay on the Metaphysical poets. Both Donne and Andrew Marvel remain with me in the form of memorised poems and as part of my notion of what constitutes the best in poetry in the English language. But much earlier, as early as the 1940s, Smithyman and Sinclair (both ten years my senior) had named themselves ‘the mudflats school’, signifying that the bays of the Auckland harbour were their imaginative playground and their primary source of inspiration. to the best man at his sister’s wedding. will be restored to us. that far wet flap, a heron departing. one kahawai is herding mackerel in the green of the stream. the crack of whips and weight of wooden yokes. heaving, sinking cloven shafts in the tracks. at the cross-cut saw. What I remember is fact. ‘How deal with’ is half our story. Words come first. was killing your talent. He was wrong. Your talent was a hungry dog that fed on scraps. On that North Shore we all bayed at the moon. meant death to a sonnet, amputation for an ode. and the showing of a shell. It was a poem about being. like salt on the wind; in came tide under mangroves. known only to the senses, spoken in sleep. in shafts of light. That was the place of beginning. were properly heard, never interpreted. and out to sea before the powers can act. while fish swim and butter melts in a pan. conjures a mud-flat; another, a scoria cave. a city goes on growing under our feet. was asked was there life south of the Bombay Hills. He said he believed there was, and went on working. Smithyman is perhaps in some ways a poet’s poet, though the longer he went on the more anecdotal and accessible the poems became – stories, as one of his titles, Stories about wooden keyboards, suggests. Keith Sinclair, on the other hand, has not weathered as well as poet and is remembered and honoured more as one of New Zealand’s most important historians, for which he received a knighthood. This was well deserved and must have pleased Keith; but he would have been disappointed, and probably was already disappointed before his death in 1993 at the age of 70, that his poetry had not made a stronger impression. He told me that as a young man he wanted most of all to be a writer – poet, but novelist and short story writer too. He chose history as his academic study and, since he excelled at it, it became his ‘day job’, and eventually more than that, his vocation and the discipline in which he made an enduring mark; but I’m sure he had hoped the time would come when he would be known for (and perhaps live by) fiction and poetry. Keith was a friend I admired for his quick mind, which was also a source of irritation – it was so much quicker than mine, and impatient. I was always anxious and explanatory in conversation, wanting to be sure I was understood. Keith understood before I’d finished speaking – but then what he understood might be, as I saw it, an approximation. I felt he cut corners; he probably felt I wasted time with refinements and elaborations. I liked his company, especially when Kay and I holidayed with him and his first wife Mary and their sons at Coromandel where they had a bach. These holidays gave me a source for the Coromandel parts of my first novel, Smith’s Dream. At the university where we were colleagues Keith liked to lunch in the common room, and probably thought me anti-social because I mostly chose to eat lunch reading or writing alone in my room. But there was a time when we played badminton together in the University gym, with Joan Anderton and Helen Clark as our partners. Joan was at that time wife of M.P Jim Anderton who would one day leave Labour to form the Alliance Party and then be made Deputy P.M. when Helen became Prime Minister. In 1968 Keith was chosen as Labour candidate for Eden, and brought a rather uneasy Norman Kirk to the University Common Room for an informal chat with supportive friends. On 27 July that year Kay and I put on a farewell party for the Sinclairs. Keith had won a Smuts Fellowship to Cambridge, and his plan was to take it up for nine months, and return still in time to fight the election. The party invitation, designed by Kay Davenport in the English Department, showed Keith and Mary riding a Kiwi with a road sign ‘To EDEN via CAMBRIDGE.’ The following year we door-knocked in support of his campaign, and distributed his leaflets. Labour Party leaflet of Keith Sinclair, photo by Marti Friedlander. 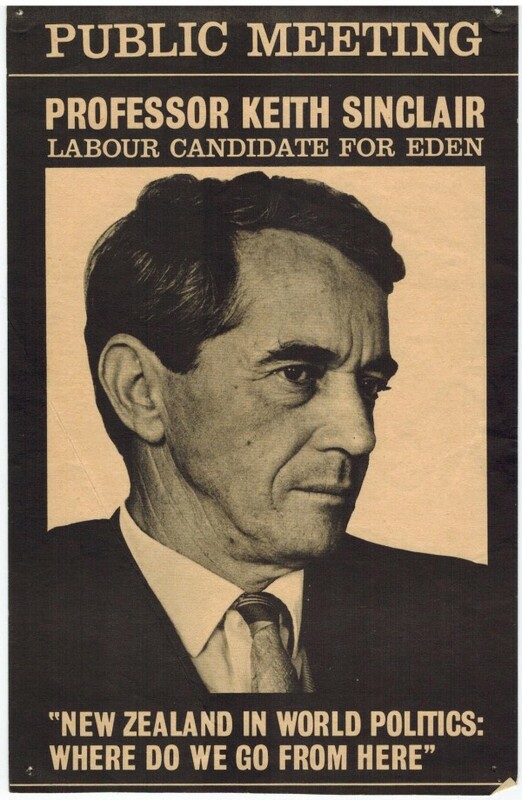 National won the 1969 election, its fourth successive term, though the numbers were close, and Keith won the Eden seat on the night from the Cabinet Minister John Rae. He attended his first Caucus meeting in Wellington while still waiting for the final count, which included special and overseas votes, and reversed the result. Keith had mixed feelings. He knew he was too impatient to have been happy sitting out three years in Opposition, so the Eden outcome was both a disappointment and a relief. He and I were strongly opposed to New Zealand’s participation in the Vietnam War. Keith’s approach to this question was probably better informed and certainly cooler than mine. For me it became for some years a political obsession and led, among other things, to the writing of Smith’s Dream. 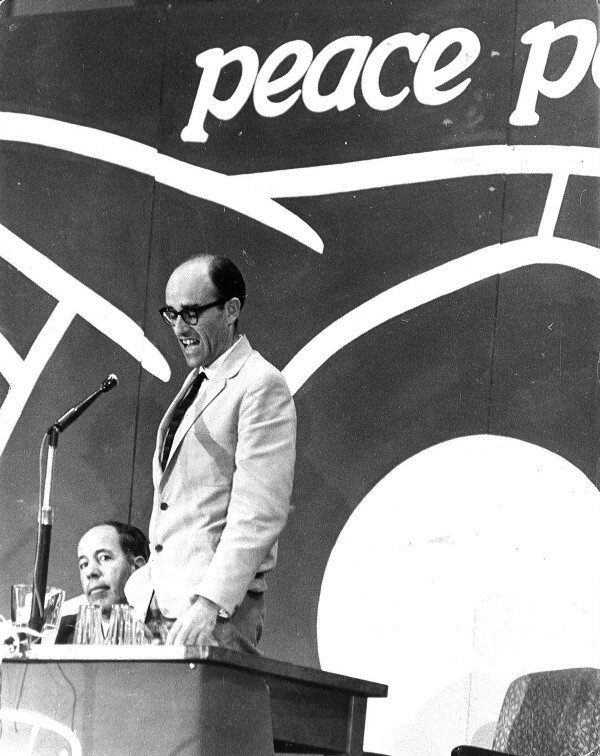 We were both involved in the Peace Power & Politics Conference in Wellington in 1968. 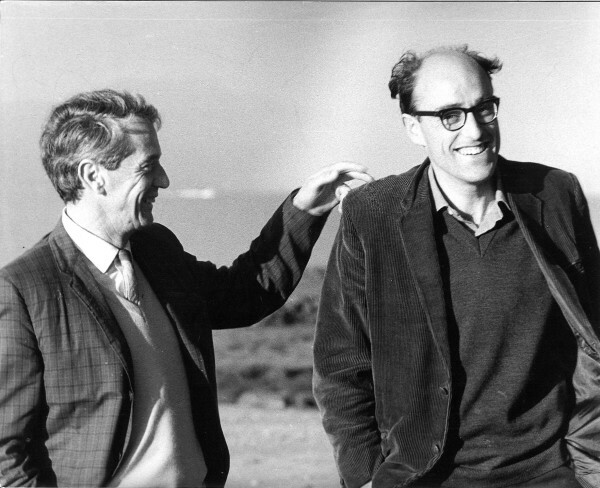 CK Stead and Wolf Rosenberg at the Peace Power & Politics Conference, photo by Marti Friedlander. Together with David Ballantyne and Maurice Shadbolt, Keith and I were also instrumental in establishing an Auckland branch of PEN (now the NZ Society of Authors) and succeeded, against quite determined opposition from Wellington writers who tended to claim what I called droit de géographie, in turning the organisation into a truly national body. We saw eye to eye on many things, and I was convinced that he, my senior by ten years and already a full Professor, played a significant part in my own early elevation to that rank. CK Stead and Keith Sinclair at Takapuna Beach, photo by Marti Friedlander. Even if I quibble about details I always enjoy reading your poems because (1) something has happened and (2) someone has thought about it. I hope there will be more. Thanks for letting me see them. He had said ‘tread softly’, evoking the Yeats line ‘tread softly because you tread on my dreams’ (a line Maurice Duggan, in his role as creative director of an advertising agency, had proposed for use in a carpet advertisement), and clearly I did that; but there were unspoken reservations. I think I might have seen those lines (along with the whole of Marvell’s ‘To his coy mistress’ some or all of which I would, given the least excuse, recite) as a weapon in the armoury of seduction. Looking at them now I still find them strong – a rhetorical overstatement, but with a hard grain of intelligence, of desperate truth. Again and so for ever – did he learn from the south? And lost (our sorrow), lost our birthright forever. I’m still not entirely sure what these lines mean, but they certainly have a tone of resonant regret, and an authority, and Curnow with his usual accuracy had lit on a poem that would stand looking at closely. Judith Binney, when she wrote her biography of Kendall, adapted the phrase ‘a legacy of guilt’ for her title. O why did she linger and why did she stay? Till she lopped off her finger and giggled goodbye. Even in poems like the one commended by Curnow the articulation is uneven, in parts strong and clear, in others obscure or inept. In a green riot, to set us free again. I write these remarks, however, flicking through my collections of Sinclair’s poems and aware that I have not looked long and hard enough (and neither has anyone else) to say anything definitive about him as poet. Strangely, no biography has been written. Perhaps when that is done it will be by someone sufficiently literary to do justice to his poetry as well as to his eminence as historian and his success as teacher. And in the brim-full bay. Put them away for good? At home in Takapuna Keith gave dinner parties which included mutton birds sent up from the South Island, and Bluff oysters. He could be good company in the right place at the right time; but he often showed signs of nervous strain. When he was first trying to give up smoking, Mary said he was given to sudden moments of violence. Later he developed strange tics and would sometimes grind his teeth. Kay said when he came to the library in the mornings in his later years his hands shook and she wondered was he on (or over) the brink of alcoholism. Certainly he was not so relaxed and genial as his brother Jack, Professor of Medicine at the Auckland Medical School and, in his day, New Zealand mile champion and record holder. When Keith died and there was a tangi on the university marae, Jack told how when they were small, he always counted on Keith as the older brother for protection against night terrors. Bob had the most original mind of any history or political science student that I met in New Zealand or abroad... Certainly I learned more from our reading and our discussions than I did in class. And yet they could not get on. As historians they competed and Keith always won in the sense that his work was published whereas Bob’s was never finished. Even Bob’s PhD remained uncompleted, so he had to suffer the indignity (which he felt deeply) of wearing a black Master’s gown rather than a bright red or maroon doctoral robe among the professors at Graduation. I think Keith was largely responsible for shifting his friend and rival over in the Arts Faculty to the subject of Politics and making it a separate Department. So Bob became our first Professor of Political Studies and Head of that Department. Bob also failed (I think one can say that) as a poet, though he aspired to be one. He edited with Jonathan Bennett O.U.P’s An Anthology of New Zealand Verse (1956), and had a very few poems of his own published in places like the New Zealand Poetry Yearbook, but they were not very good and he never published a collection. Keith, Ken and Bob were ‘called up’ in WWII, rather late to be involved in significant fighting, though Keith records that he spent two years with the RNZ Navy; the fourth of the quartet, Duggan, had had a leg amputated as a result of osteomyelitis in youth, and was ineligible. Smithyman, whose mind tended to jump, or swing, from one branch of learning to the next, was, I suspect, a failure academically, never completed a degree, and yet he easily outstripped Keith and Bob as a poet. Duggan was a good friend to Keith but seriously alcoholic. He made his reputation as a writer of short stories and novellas – and at his rare best we possibly still have no better practitioner; but he published poems too, and a collection published after his death, A Voice for the Minotaur, showed some of the ‘natural grace’ Keith mostly seemed to lack. Maurice died in 1974, aged 52. As a piece of social history it is interesting to put their wives into the picture. Barbara Duggan was a physiotherapist, and continued to practice after marriage, for a considerable period supporting Maurice while he wrote full time. Unlike the other three she had only one child. Mary Sinclair, Noelene Chapman and Mary Smithyman were all school teachers until they married and had their first child, after which they devoted themselves, for a time in the Smithyman case, I think for life in that of the other two, to family – which was, I suppose, what they had been brought up to expect of married life. But Mary Smithyman, who wrote poetry using her maiden name, Mary Stanley, returned to teaching after the birth of her third son, and would have continued if she had not been so disastrously afflicted by rheumatoid arthritis. She was a notable poet, and Kendrick was her second husband, her first having been killed in the war. She published her first and only collection of poems, The Starveling Year, in 1953. It’s impossible to be sure why she did not continue as a poet (and she did try), but it seems the early onset of the arthritis set her back in every way. She died aged 60 in 1980 and Kendrick married his fellow-Senior Tutor in the Auckland English Department, Margaret Edgecumbe. Keith Sinclair’s second wife, Raewyn Dalziel, was likewise some decades his junior, a professional woman, an academic who would publish a biography of Julius Vogel and other work on 19th century New Zealand history, would follow Keith as Professor of History at the University of Auckland, and rise to the rank of Deputy Vice Chancellor. I suppose she was technically Lady Sinclair after his knighthood, but she preferred always to be Professor Dalziel and never used the title or the name. In the case of Keith and of Kendrick the difference in role between the first and second wife marks almost a change in our social history; and it’s notable that, like Allen Curnow’s second wife, Jenifer (née Tole), another academic/professional woman, neither had children – as if this was the price of being the second wife. Of the four men I have written about here, Bob Chapman seemed the most securely married. ‘Bob and Noel’ were such a tight unit there were sometimes affectionate jokes about their being of ‘one mind’ – and sometimes out of it. They seemed always to read the same books, and either would say what ‘we’ thought of any one of them – or equally of a movie, an art exhibition, a political event, a jazz concert. These four Aucklanders, Keith and Bob, Kendrick and Maurice, I see as, each of them, exceptionally talented, serious, committed, ambitious, driven, hard-working and successful. Keith established New Zealand history as a serious academic subject, and in his published work he was one of the first to do some kind of justice to the Maori side of the race equation. Kendrick will endure as one of our most notable 20th century poets; and Maurice likewise as one of our best short story writers. Bob was one of the earliest to establish New Zealand Politics as a subject of serious academic study. Keith’s personality was urgent, impatient, quick, curt, seldom charming although too intelligent to be entirely lacking in tact. Bob’s was ponderous, important, serious, instructive, full of conviction and emphasis, but with ample good will and therefore kindly. Kendrick’s was theatrical, loquacious, oblique, often obscure, a self-protective and self-concealing story-teller whose apparent confidence was largely a cover for its lack. Maurice’s was also theatrical, a whole second persona or mask constructed over the first, not false exactly, but a larger and louder and posher self, sometimes priestly (a residue of the Catholicism he had unequivocally rejected) and often necessarily fuelled by alcohol. I cannot ask these questions without being aware of myself as their junior by ten years, and imagining them collectively looking at me, not uninterested, perhaps grateful for serious attention, half-amused, but most likely also irritated by my impertinence. Perhaps this ‘up-close’ view is too close for a clear and fair focus – too close for comfort – and their varying successes and failures were no more than the vicissitudes of chance and the genes in any one group at any place and time. They were important enough to deserve a close look, and so the slight cracks become apparent. If they were less significant no such inspection would be called for; no such questions asked. Out of some old picture book. Accustomed perhaps – but they are missed.